When sailing lateral separation is crucial. 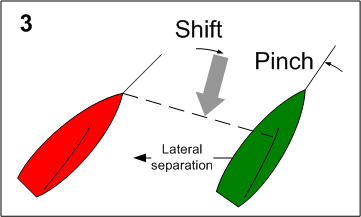 Being “On the wrong side of the shift” means that if you are to the right of your competition and the wind shifts left (or vice-versa), you lose distance to weather. It has nothing to do with how fast you are, it depends on your lateral separation. You can manage (pump) your lateral separation by tacking or Wallying. However, most of the time, tacking is inadvisable (see Break-even tacking). But much of the time, you can safely Wally and gain by pumping your lateral separation (in addition to the gain of the Wally itself). You will need an accurate real-time wind direction readout to do this properly. 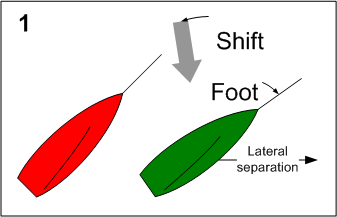 (1) Green is in a lift (favoring Red) so he foots, increasing lateral separation at no cost in Vmg, in preparation for the right shift to follow. Footing the amount advised by the Wally technique will increase lateral separation while actually gaining Vmg up the average wind. You could foot faster to increase lateral separation faster with only a small loss in Vmg. This is why you hear the saying Foot to the header. And the Wally tells you exactly how much to foot. 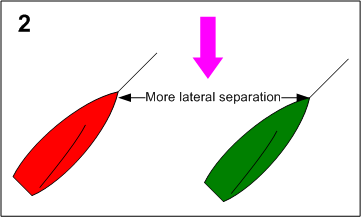 (2) When the lift ends, Green has increased lateral separation. (3) When the opposite shift happens, Green is ahead due to the increased separation. Now he pinches in the header so the lateral separation gets smaller, in preparation for the next left shift. The Wally also has an optimum pinching value, and you could also pinch more. You never hear Pinch to the lift, but it’s equally valid. Keep this to yourself. Since the gain depends on lateral separation, a number can’t be assigned to it, but it can be big. Gain or loss is 2% of lateral separation per degree of shift. In other words, a 5º shift is like a 10% of separation gain! You can actually pump separation more than normal if the situation requires it. As you remember, optimal Wallying produces a bit of gain to weather. You can trade in that extra Vmg and pinch or foot more than optimal to change sailing lateral separation a lot faster without losing Vmg. For boat-on-boat, best Vmg becomes almost irrelevant. It doesn’t matter if you finish in the middle; the idea is to beat your arch enemy. And for this, sailing lateral separation is the tool of choice. The idea of hyper-pumping is to change separation by tacking instead of merely Wallying. When you Wally, the separation rate is about 10% of boatspeed, and there is no DLw to contend with. If you tack, separation rate is about 140% of boatspeed, but there is the DLw issue to contend with. All separation pumping works downwind as well, and there is less DLw (DLd in this case) to worry about. If this discussion interests you, please register to receive a more detailed presentation on the Wally , tacking and sailing lateral separation.